Museums and schools evolved as the definition of the concept of education to describe a lifelong process of developing knowledge, skills, values and attitudes that take place not only in the classroom, but also in a variety of formal and informal contexts and settings. In order to fulfil and extend the potential of the partnership, museum educators and school teachers should be assisted to develop a comprehensive understanding of the nature of the museum-school collaboration. They should learn the difference between museums and classrooms. When the Botswana National Museum was established in 1968, the Botswana government aspired to avail information relating to Botswana customs, indigenous knowledge system and values to Botswana's future citizens, with the hope that the information and artefacts collected at the time would retell the story of Botswana to learners and the public alike. 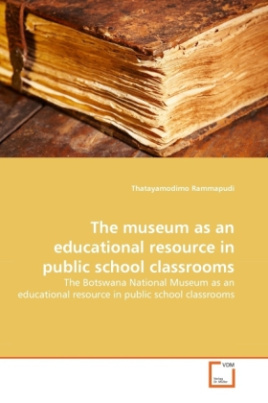 The Botswana National Museum, through its educational programmes, has the capability to help educate learners; make teaching and learning an exciting undertaking; and provide the opportunities for hands-on activities and interaction with real objects.